AMAZON PRIME DAY is LIVE!!! Be sure to bookmark our Amazon Prime Day Deals page and read on to learn some tips and tricks, PLUS how you can win an Amazon gift card! (We’ll have FORTY winners!) AND below I will share what the hot items of 2017 were and some Prime Day Deals that are already live! BRING IT! The 4th annual AMAZON PRIME DAY starts at 1pm MST (July 16th) and goes through end of the day on July 17, 2018 (ps – I’m celebrating it in a big way… scroll down for more because you could win an Amazon Gift Card!). It’s 36 hours of AWESOME DEALS people! Make sure you come here when it starts because we’ll be sifting through hundreds of thousands of deals and posting a few hundred of the very best! If you’re not familiar with Amazon Prime Day, read on. If you want some tips on how to stay within your budget, go read tip #4! If you want to learn how to win some amazon gift cards, scroll to tip #6! Make sure you enter to win one of 40 amazon gift cards I’m giving away! See more about this below! What is new about Amazon Prime Day 2018? What are the best strategies for shopping Amazon Prime Day? What kinds of deals will be there be? 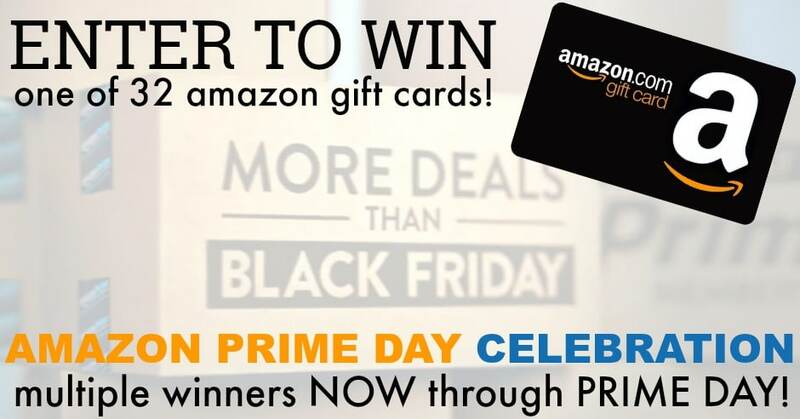 PS – I’ve got 40 AMAZON GIFT CARDS that I am giving away now through PRIME DAY! In fact, 25 of them are DURING the Prime Day 36 hour sale! One of them is valued at $100!! All you need to do is vote for your favorite Amazon deals (more on this later on). #1: What is Amazon Prime Day? Amazon Prime Day is an online event where record breaking deals will be published for 36 hours to celebrate the 23rd birthday of Amazon. That is 6 hours longer than 2017 Prime Day! Amazon Prime Day started back in 2015 as a way to celebrate 20 years in business. Because the company saw SO much success, they decided to keep doing it every year in July to give thanks to their customers and help them find the best deals around (and let’s be honest, they make a lot of money too). #2: What Are the Requirements to Participate in Amazon Prime Day? You need to be a member of Amazon Prime in order to get these deals! I LOVE AMAZON PRIME! It is $119 for a year subscription and you get SO many benefits. There are a few ways to save if you’re not currently a prime member. You can get a FREE 30 day trial of Prime RIGHT NOW. All you need to do is sign up for this free trial BEFORE Amazon Prime Day! With your free subscription, you can gain access to all the deals that will be available. Here is the key though! After you sign up for the 30 Day Free Trial, it will automatically renew and charge you the $119 once the 30 days are up! SO, if you are not wanting to buy a year subscription (which, I really think you should because it is worth it!) make sure you cancel your subscription before the 30 days are up! If not, you will be charged! Canceling is SUPER easy if you decide Prime is not for you! Students with an .edu email can get a membership for only $60 and they can also get a free Amazon Prime Student 6 Month Trial! Already used the free trial? You now have the option to sign up for Prime month to month. So for $12.99, you can participate in the Prime Day sale AND enjoy all the other benefits of Prime! #3: What is new about Amazon Prime Day 2018? Whole Foods Deals: you’ll save an extra 10% off sale items at Whole Foods… but even better is that if you shop at Whole Foods anytime between now and July 17, and spend $10, you’ll get a $10 voucher to use during the Prime Day sale on Amazon.com! #4: What are the best strategies for shopping Amazon Prime Day? This day is complete MADNESS, but my team and I will be here to help you all along the way! What you can expect is that hundreds of thousands of items will have reduced prices for just one day! On top of the normal discounted deals, you’ll also find Lightning Deals. On Prime Day, there are THOUSANDS of lightning deals being released every FIVE MINUTES! Some are exceptional and others are just “meh”. The great ones will sell out FAST. Here are some tips for getting Amazon Lightning Deals. And make sure that you purchase the lightning deals immediately after claiming the item. Well, you’ve got 15 minutes to get it done, otherwise you’ll lose it. The good thing about that is if you are a little late to the game and the product is “sold out”, you can “join waitlist” and every time people lose their claim, the person who is next on the waitlist will get the opportunity to buy! So always join the waitlist if you initially miss the deal. Take a moment and write out a list of items that you need, want, or have been dying to have. Think about Christmas, or back to school, or upcoming weddings, or just things you need around the house. During the Prime Day sale, you can come over to our Amazon Deals Page and use our filter to see if anything you need is showing up (here are some tips for using our filter)! If you just try and look through all the deals, you will be stuck searching for HOURS and may end up missing the deals that you really were needing. Set a budget and choose to stay within it. Found something you think is a good deal? Use Google shopping guides to price compare and determine if it really is a good deal or not. #5: What Kinds of Deals Will There Be? Unfortunately, I cannot tell you EXACTLY what deals will be there this year because Amazon has the deals under lock and key! BUT, I can share the top deals that Fabulessly Frugal readers have enjoyed in 2017 (and my 2018 prediction on some of them). $5 off a $15 book purchase – we have not see a promo like this, but take advantage of this deal! Readers who are Prime members and new to Kindle Unlimited (even if a former customer) will have access to three months of unlimited reading for just $0.99 (regularly $9.99 per month). In addition, when you buy your first Kindle book, you’ll get a $10 Prime Day credit valid towards eBooks, print books and Audible! Save on Amazon Echo – it was $89 (reg. $179.99) in 2017 – Now it is Reg $99 – this was before the 2nd generation Echo was released, and now the regular price is significantly lower than what it was a year ago. So I suspect we’ll see a nice price drop larger than $10. Save $30 on Amazon Fire TV – Amazon recently debuted the Amazon Fire TV Cube for $119 – so we are looking for discounts on the regular Fire TV as well as the Cube! Save $30 on Kindle Paperwhite – in 2018, the Kindle Paperwhite will be at least that much off! Echo Dot was $34.99 (Reg $49.99) – and this is already the sale price, so I wonder if it will drop even lower on Prime Day? OR the might come up with a product bundle involving the Dot. Select Fire 7 & HD8 Tablets and Bundles (Starting at $29.99 Shipped) – we expect to see big discounts this year also across this whole line of Fire tablets! The Instant Pot was all the rage in 2017 and continues to be a most wanted item! For 2017, the Instant Pot 7-in-1 Pressure Cooker 8-Quart was just $89.99 (reg. $129.99) – currently the regular price of the 8-Quart is just $119.99 – hopefully we will see another good deal on the Instant Pot! Currently $99.99, this Kids’ Kindle Bundle w/ Cover & Worry-Free Guarantee was $69.99 for 2017. Look for a nice discount here in 2018! There is currently a deal to snag TWO All-New Fire HD 10.1″ Kids Edition Tablets for only $299.98 (Reg. $399.98), including 2-year full guarantee and 1 year of FreeTime Unlimited. In 2017, Amazon promoted their Prime Pantry with a $10 off $60 offer. This year is even better – save $10 off $40 – plus stack other discounts with that to save huge. 23andMe DNA Tests were hot in 2017. The basic kit was on sale for 49.99 (50% off its original price), while the premium kit was a discounted $99.99 (from its full price of $199.99) – they are currently $99 for the basic kit and we don’t know if there will be a Prime Day special on these, but would not be surprised as DNA testing continues to be a hot trend. Prime Day 2017 was hot for robo vacs! The Eufy RoboVac 11 Vacuum was just $189.99. Currently $249, it would shock me if we do not see some nice deals on robo vacs this year. Lots of you snagged deals on American Girl dolls last year for a steal (some were 2/$44)! Hopefully they are going to offer a discount this year as well! Diaper Deals were HOT in 2017 – Huggies Diapers were as low as 7¢ Per Diaper! Expect lots of hot deals in Baby – and look for a nice deal for the Baby Registry on Prime Day 2018. Make sure you take advantage of Amazon Family as it snags you 20% off on some items like diapers and wipes when you Subscribe & Save! The Blendtec Total Classic Blender was $240.18 (Regularly $400) – currently $270, hopefully a good deal on quality blenders will be happening again! We also had a Free $5 Amazon Credit with a $25 Gift Card Purchase. Fingers crossed we see something similar in 2018! Lots of TVs – The deal inventory of TVs will be nearly 2x than Black Friday and Cyber Monday combined. Toys All Day – Members in the U.S. will find toy deals nearly all day on Prime Day. Watch-A-Deal – Readily track and shop any deal while at home or on-the-go with the Amazon App. Learn more at amazon.com/watched. Alexa Specials – There will be benefits to being an owner of an Amazon Echo, Echo Dot or Amazon Tap on Prime Day. More to Watch – Members will find unbelievable deals on some of today’s top rated TV series and popular blockbuster films to rent or purchase and instantly stream on Amazon Video. #6: How Can I get the BEST Prime Day Deals and How Will Fabulessly Frugal Help me on Amazon Prime Day? Go to any Fabulessly Frugal facebook post and leave a comment that says PRIME. Moments later, you will get a chat message from me (it’s an automated bot). Follow the prompts in order to subscribe to the deals! Click HERE. It will take you to Facebook Messenger. Then click “Get Started” to wake the bot. Then select “Yes Please”. Then just click the deal category you want notifications for. It’s THAT EASY! When you no longer want to receive notifications, you can just silence them in Facebook Messenger. You can view them any time, but you won’t get pinged by Messenger. OR you can unsubscribe by selecting “unsubscribe” on the Messenger menu within the chat with me. This will be the MOST INSTANT way to learn about the HOTTEST DEALS!!! My team and I are will be searching through Amazon ALL DAY and keep you updated so you know exactly what deals are up! We will spend the hours searching through the thousands of deals and we’ll post the ones that people like you will actually want! Also make sure you follow Fabulessly Frugal on Facebook and turn your notifications on. I’ll be sharing direct links to some awesome lightning deals you won’t want to miss there! WHY are we doing this? Well, because we’re online shopping addicts just like you are! 😀 Just kidding (kind of). We love shopping online and are genuinely excited about big sales like this! We love to help you by sorting through and finding the best deal. And YES, when you come to FabulesslyFrugal.com/deals and click on our links, we get a small commission when you purchase something. So shopping through our links helps support our team! So, thank you! Simply come to the Deal Blog at Fabulessly Frugal, browse the deals and vote on your favorites! Winners are randomly selected and you will be notified INSTANTLY if you are a winner. You’ll get the gift card code right then! Yes, it’s that easy! Head here to learn ALL about how to vote and win a gift card! I love sharing amazon gift cards with you! So, do your part, get prepped, and we will do the rest! Here’s to Black Friday in July! Leave a comment and let me know what item(s) you’re hoping to find a deal on! I bet we’ll see deals on both! I really need a new cell phone and hope this might be a good day to get one! Hopefully they’ll have some great promos! Cool! I think that’d make for a great deal! Cool! Are you open to a bed in a box for the mattress Aileen? I’m sure there will be TV deals! A nice laptop for my son. What sort of features are you looking for Holly? Did I hear that teachers get an extra discount? Anyone know how to set that up? Hi Kara, I haven’t heard that one actually! We searched and didn’t find any info on it either. Let me know if you come across it! So last year the fingerlings were a huge hit and somehow you knew they would be hot for Christmas, do you have any idea what it will be this year?? And Thank you, for all you do! Although some are having issues getting it to their cart. Keep trying!